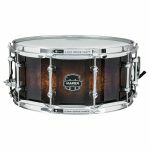 Whether looking for the warm sound of a wood shell snare drum or the brash attack of a metal shell snare drum, check out our various snare drums to give your playing the sound you need! 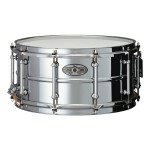 These snare drums are all carefully chosen for their versatility and reasonable pricing. 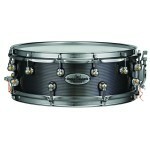 The Mapex MPX Midnight Black Maple Snare Drum has an all natural maple shell. It's a high-quality, affordable drum that's warm and sensitive, yet delivers a full projecting sound. Versatile for R&B, Jazz and Rock. It features Transparent Midnight Black Lacquer finish with Black hardware, low-mass lugs, fully adjustable throwoff and Remo UX drum heads. Available in 3 sizes: 13" x 6"; 14" x 5.5"; 14" x 8". 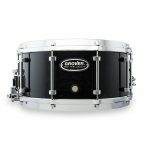 Mapex has developed a hybrid shell with the introduction of the Velvetone Snare. 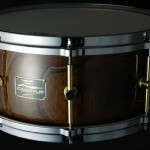 It is a 9 ply shell consisting of maple/walnut/maple. 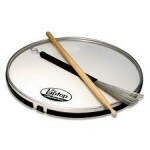 The size is 14" x 5.5", and ideal for a broad range of musical styles. The color is named "butter burst" and lives up to the description. It has a warm and focused sound. 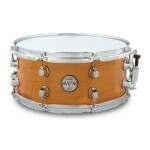 The Mapex MPX Gloss Natural Maple Snare Drum has an all natural maple shell. 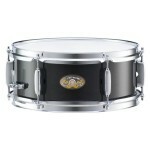 It's a high-quality, affordable drum that's warm and sensitive, yet delivers a full projecting sound. Versatile for R&B, Jazz and Rock. 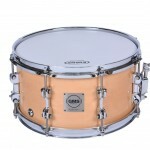 It features a Gloss Natural finish with Chrome hardware, low-mass lugs, fully adjustable throwoff and Remo UX drum heads. Available in 2 sizes: 13" x 6"; 14" x 5.5". 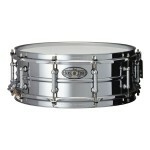 The 13" x 3.5" Mapex MPX Steel Piccolo Snare is a bright, sharp attacking drum. The shallow depth enhances the pitch and attack potential, while the 13" diameter keeps overtones focused and to the point. It will cut through electronics and with proper tuning will produce crisp highs to fat lows. 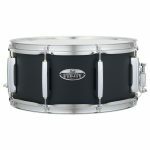 This very affordable drum features: 1.0mm steel shell; chrome finish; low-mass lugs; chrome hardware; fully adjustable throw-off; Remo UX drum heads. 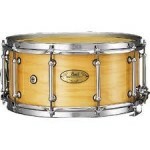 The Pearl Firecracker Snare Drum with 8 ply Poplar Wood Shell "pops" like a firecracker. They are a no nonsense drum which will cut through to the max. Available in 10" x 4"(6 ply) and 12" x 5" sizes. 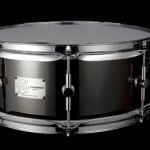 If you are looking for an explosive drum with a huge sound the Firecracker is the right choice! Also available with a Steel shell. 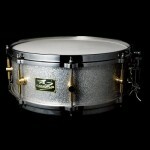 The Pearl Firecracker Snare Drum with steel shell "pops" like a firecracker. They are a no nonsense drum which will cut through to the max. 10" x 5" size. 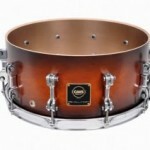 If you are looking for an explosive drum with a huge sound the Firecracker is the right choice! 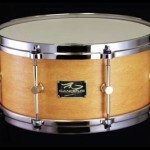 Also available with a Poplar shell. 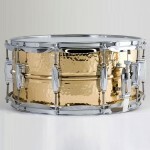 The Steel Shell snare drums are bright and have a long decay. Yamaha has one size in the intermediate level. The crisp and articulate 5.5" x 14." The hoops are triple-flanged and they are 8-lug drums. These are definitely a good choice if you are looking for enhanced volume. 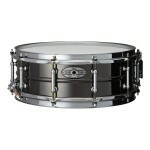 The SensiTone Steel Snare Drum 14"x 6.5" has a mid-range overtone, but also a sharp "crack" sound. 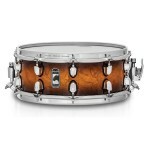 It is a sensitive, classic beaded shell in steel that cuts through and features the new Clip-Lock Strainer System that locks into place and keeps snare tension from loosening. It can be tuned to a low pitch and still project. Free shipping continental US. 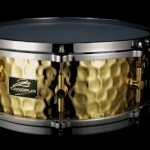 The Brass Cat is designed to have a warmer, softer attack than a steel shell drum. 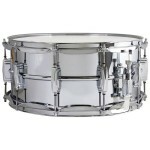 It comes in 14 x 5.5 dimensions with steel hoops and a classic 45 degree bearing edge. Don't be fooled! This brass shell can project tremendously and also be very sensitive due to the well designed cylinder-drive strainer. The adjustment dial employs "micro-lock" technology that provides precise control. 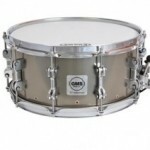 This is a full bodied snare ideal for all around use. The tone is dark and focused. The shell is 6 ply maple and is 14" x 5". The attraction of the transparent black shell with brushed black hardware has a classic look. A centered bearing edge (45 degree) with rounded back-cut limits unwanted overtones and produces a more round and centered tone. 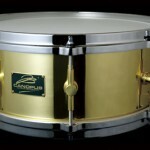 The Nomad is a 13" x 6" brass shell snare drum recently introduced. It has a warm, sensitive, open sound. Musical uses for the Nomad range from electric jazz to strong rock. It has tremendous attack and yet great depth. Not for the timid. 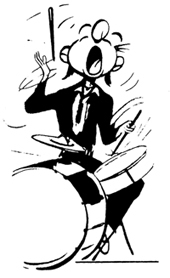 This drum can scream! Brushed Black and Chrome hardware. 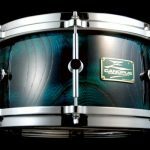 The Canopus Gunjyo Zelkova snare is a limited product available through 2018. The drum is 6 1/2 inches by 14 inches and the color extremely rare for this wood. The shell is a hollowed zelkova wood one piece. Die cast hoops are included and all hardware is chrome. These are made to order and delivery approximately 90 days. These drums are surely to become collectors' items. Free shipping. 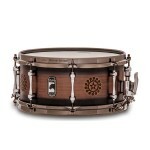 Pearl's 14" x 6.5" Brass SensiTone Snare drum has real "punch" and warmth. 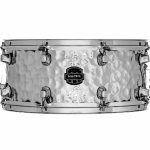 It is a classic beaded shell in Nickel-Plated Brass and features the new Clip Lock Strainer System that prevents any snare tension loosening. 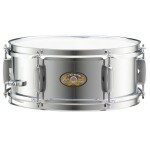 This is a very attractive drum with chrome hardware on a brass shell.Free shipping continental US. This Pearl Piccolo 13" x 3" Snare Drum features a Brass shell and is known for it's ability to project and cut through loud electronics. 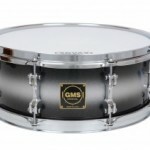 This drum serves equally well as a primary instrument or as a secondary "effect" snare drum. Free shipping continental US. 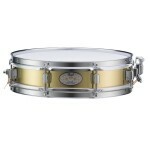 Pearl's 14" x 5" Brass SensiTone Snare drum has real attack but the warmth of brass. 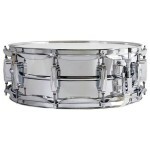 It is a classic beaded shell in Nickel-Plated Brass and features the new Clip Lock Strainer System that prevents any snare tension loosening. 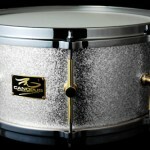 This is a very attractive drum with chrome hardware on a brass shell. Free shipping continental US. 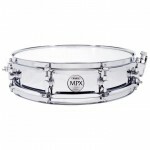 Mapex MPX Hammered Steel Snare 14" x 6.5"
This Mapex MPX Hammered Steel Snare 14" x 6.5" is a bright snare drum with dry overtones. Because of the hammering, the drum is very versatile. Primarily used for Fusion Jazz and more Progressive Rock styles. It will cut through electronics and with proper tuning will produce crisp highs to fat lows. 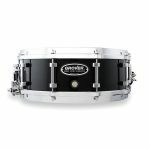 This very affordable drum features: 1.0mm steel shell; chrome finish; low-mass lugs; chrome hardware; fully adjustable throw-off; Remo UX drum heads. 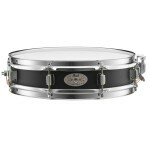 This Pearl Piccolo 13" x 3" Snare Drum features a Steel shell with Black Lacquer finish. 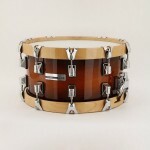 Known for the ability to project and cut through loud electronics, this piccolo snare drum serves equally well as a primary instrument or as a secondary "effect" snare drum. 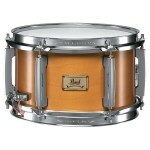 Pearl's Modern Utility Snare Drum features a 6-ply all Maple shell. It is designed for the working drummer and the CL Bridge Lug and SR700 strainer is top notch. Triple flanged hoops are standard and increase projection of the drum. 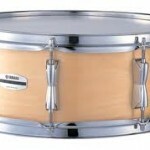 This is a very resonant, versatile and clean sounding drum. 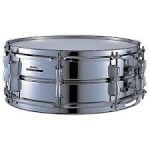 The MUS1465 model is the very popular 14" x 6.5" size. Available in Black Matte finish. 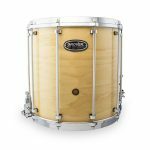 This Pearl Popcorn 10" x 6" Snare Drum features a six-ply Maple shell and is known for it's ability to project and cut through loud electronics. 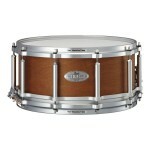 This drum serves equally well as a primary instrument or as a secondary "effect" snare drum. Free shipping continental US. 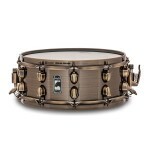 The Mapex Armory Series Exterminator Snare Drum 14 x 6.5 features a hybrid shell of birch and walnut woods for powerful attack and focused sound. 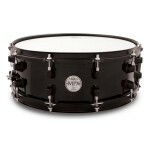 The 14"x 6.5" hybrid shell is a stunning Ebony Stain over Figured Wood. 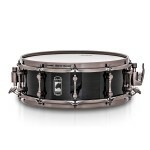 Encased with solid steel tube lugs, the Exterminator is a dark but mass attack sounding snare. The Piston Strainer with Vertical Throw-off is silent and precise. 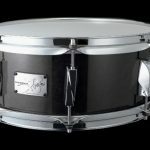 Pearl Dennis Chambers Signature Snare Drum 5" x 14"
The new Dennis Chambers Signature Snare Drum is 5" x 14" in Cast Aluminum. Designed for Dennis, the top hoop has 12 lugs and the bottom 8. This creates a particular tuning for the style of music he plays. 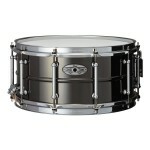 The Black Nickel shell with Nickel hardware is eye catching. This is a projecting drum with explosive back beat potential! FREE SHIPPING WITHIN CONTINENTAL USA!